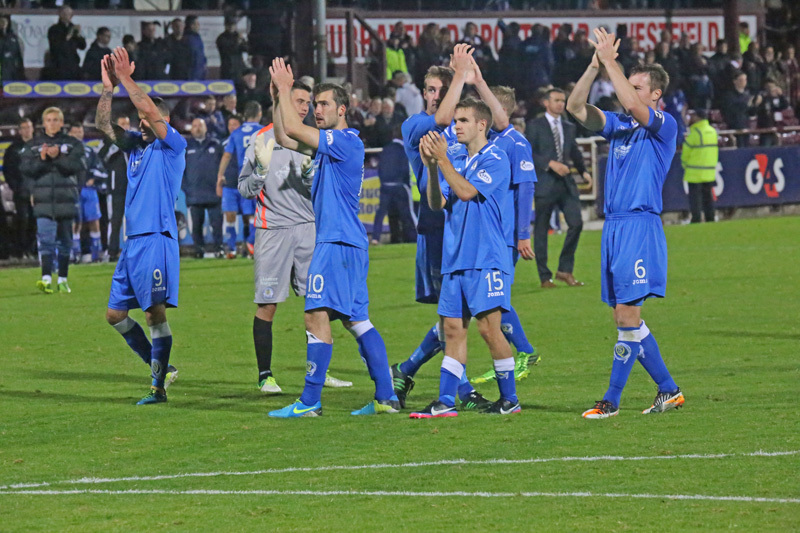 A large and boisterous travelling support saw their favourites Queen of the South fall at the final hurdle as they went out of the League Cup 4-2 on penalties to Heart of Midlothian after a pulsating encounter. 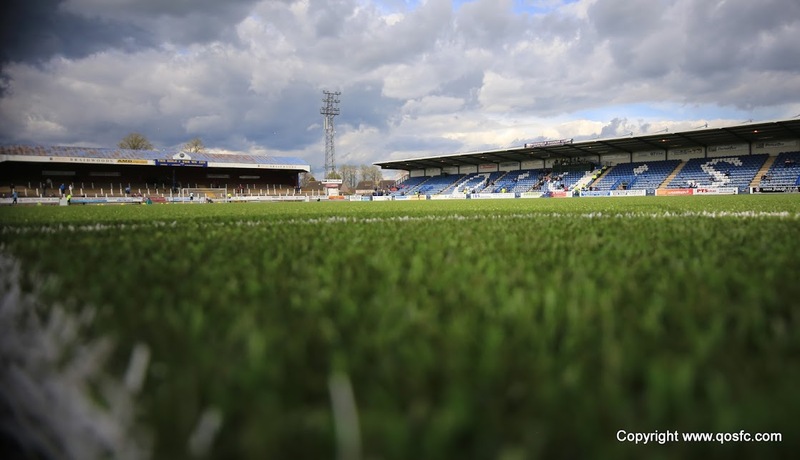 Queens had fought back to equalise no less than three times in the 120 minutes of open play as the match finished in a 3-3 draw and the Doonhamers may well have felt it was a match they should have won. Goals from Kevin McHattie, a penalty from Jamie Hamill and a close range finish from Danny Wilson were matched by Ryan McGuffie`s early effort, a Michael Paton finish and Chris Higgins` fantastic strike in the closing stages. 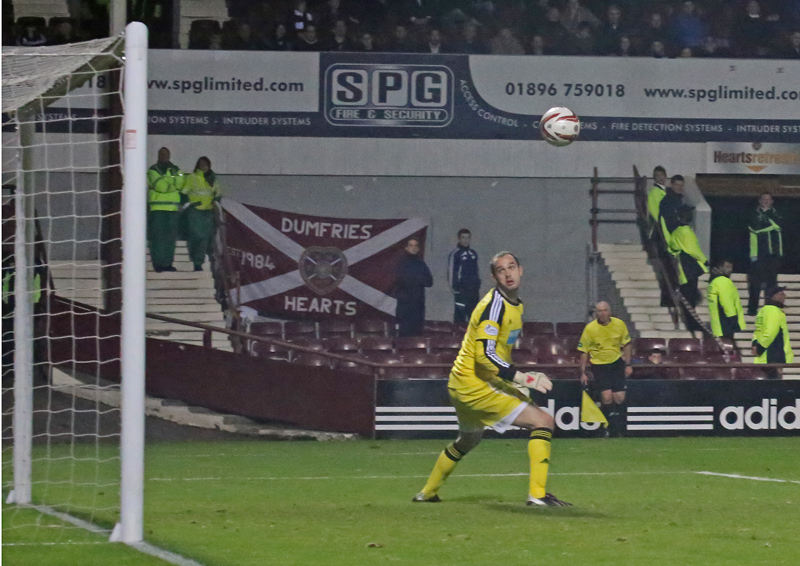 The match began with Queens in the ascendancy as they racked up a number of set-pieces but were unable to test Jamie McDonald in the Hearts goal. Despite the positive start from Queens they fell behind after just 14 minutes. It came from a bit of misfortune for the Queens defence as Derek Young stopped Hearts striker Gary Oliver`s jinking run only for the ball to rebound into the path of oncoming left-back Kevin McHattie inside the area who had only Calum Antell to beat. He did so with aplomb as he fired the ball low into the far corner to give the Premiership side the lead. The visitors responded almost immediately though as Ryan McGuffie met Ian McShane`s corner on 20 minutes only to see former Queens `keeper McDonald acrobatically keep the ball out. Fortunately for McGuffie and for Queens the ball rebounded straight to the defender and he made no mistake with a left-foot finish to level the scores. On the balance of play it was a goal Queens deserved and they should have added to it on the half hour mark. A Paton and McShane move broke down on the edge of the Hearts area only for Jamie Hamill`s tackle to fall kindly to an unmarked Derek Lyle six yards from goal. It was no doubt the easiest chance he`s had all season but the Queens top scorer fluffed his lines and sent the ball high over the crossbar. It was a bad miss but gave the Queens players and fans a lift and they continued to create chances. Firstly Iain Russell had space inside the Hearts area but miscued his shot well wide before the best move of the match opened up a shooting chance for Michael Paton just before half-time. It really was excellent play all round from the Doonhamers as Russell and McShane exchanged passes on the left-wing to open up space for the winger to gallop into. Russell got his head up and cut a low cross back to meet the run of Paton on the edge of the Hearts area and his first time shot flew just wide of the near post as the Jambos fans breathed a sigh of relief. The second half got off to a bad start for Queens however as referee John McKendrick awarded the home side a penalty to the anger of Jim McIntyre and the away fans. Hearts winger Jamie Walker fell to the ground as he looked to bustle past McGuffie and Higgins and the referee pointed to the spot. 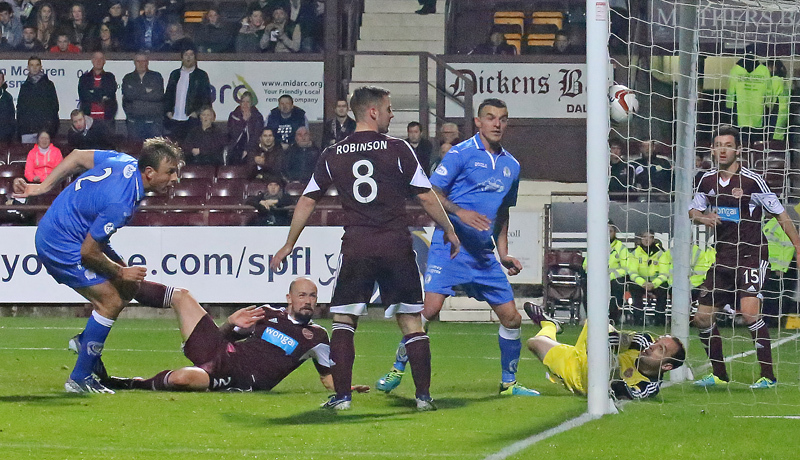 Jamie Hamill stepped up for the hosts and sent Antell the wrong way to put his side back into the lead. The away side did not let their heads drop though and kept their level up bringing a second equaliser on 62 minutes through Michael Paton. The goal came from a good run by Derek Lyle as he latched onto a long ball over the top of the Hearts defence before cutting the ball back for Paton to fire low past McDonald. The match meandered towards extra-time with Ian McShane having the best effort of the remaining time as he let fly on the turn from the edge of the area only to see his effort go straight at McDonald. 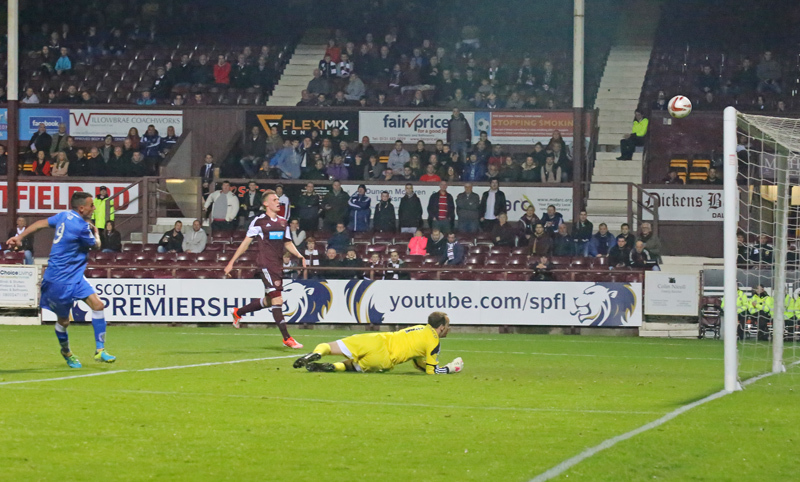 Into extra-time and Hearts took the again after only 3 minutes through Danny Wilson. A sharp corner routine found Jamie Hamill free on the edge of the Queens area and his low shot was flicked into the net by the former Liverpool defender Wilson. It looked like the chance was gone for Queens as shots were at a premium for the rest of the match as tiring legs took their toll. McShane and Paton each fired over before Higgins levelled the scores with four minutes left. A free-kick from Chris Mitchell dropped to the Queens captain just inside the area and hitting the ball on the half-volley he found the top corner to send the match all the way to penalties. Hearts sub Jordan McGhee was up first and he found the right-hand corner before Derek Lyle found the bottom left corner with his spotkick. After netting his earlier penalty with ease Jamie Hamill could not repeat it and sent the ball a yard over Antell`s crossbar. Queens had the chance to take an early lead but the normally trustworthy Chris Mitchell smashed his penalty onto the Hearts crossbar to keep the score at 1-1. Hearts then regained the lead through Dylan McGowan but Michael Paton could not echo his earlier finish as Jamie McDonald dived low to his left to push the ball out giving his side a precious lead. Billy King hit his spotkick low and hard to the left of Antell`s goal and Kevin Dzierzawski placed his straight down the middle to keep Queens` hopes alive. That hope was extinguished however as Dale Carrick found the top corner to send Hearts through to meet Edinburgh rivals Hibernian in the next round. 2 min Queens have lined-up in their usual 4-3-3 formation with no changes from the side that beat Morton at the weekend. 6 min ...McShane hit it deep from the left wing but Derek Lyle fouled his marker and Hearts have a free-kick. 11 min Decent start from Queens with a couple of set-pieces but Hearts have the first effort on goal as Antell saves Robinson`s low shot. 14 min Decent chance for Queens as Ian McShane swings in a free-kick from deep and Chris Higgins rose well to meet it but sends his header over. 16 min Unfortunate goal to concede for Queens as Young did well to block Oliver`s run but the ball ricocheted into the path of McHattie to bury it. 21 min Another set-piece for Queens and this time a goal. McGuffie`s initial header was saved but he bundled in the rebound. 23 min Another set-piece for Queens and this time a goal. McGuffie`s initial header was saved but he bundled in the rebound. 31 min It`s been a very even first half hour with each team giving as good as they`re getting. Nothing between them. 34 min WHAT A CHANCE! Queens attack well and the ball drops to Lyle 6 yards out and he skies it. Not sure if even he knows how he missed it. 41 min The Hearts fans are getting a bit restless due to some perceived injustices from the ref. Iain Russell has space to shoot but mishits badly. 45 min Excellent move from Queens as Russell and McShane exchange passes before Russell cuts it back for Paton to fire just wide. Top play. 52 min A soft penalty for Hearts as Holt ran through and fell under the challenges of McGuffie and Higgins. Hamill stepped up though and finished. 55 min Yellow Card : Iain Russell picks up a yellow after an altercation with McGowan and a late challenge to follow. 58 min Iain Russell wins a free-kick on the left wing after a good run. McShane overhits it though and a good chance is gone. 61 min Just one goal there! Machine went a bit mental. Like the Queens fans as Lyle latched onto a long ball and cut it back for Paton to finish. 63 min Immediately after his goal Paton has a chance to shoot again this time from 18 yards but sends it wide. Game on. 64 min Yellow Card : Hearts` Dylan McGowan takes out Russell on the wing and earns a booking. 65 min Two subs for Hearts as McGhee and King replace McKay and Oliver. 67 min Queens are on the attack again and Derek Lyle tries his luck from the right-hand corner of the box but sends the ball over the bar. 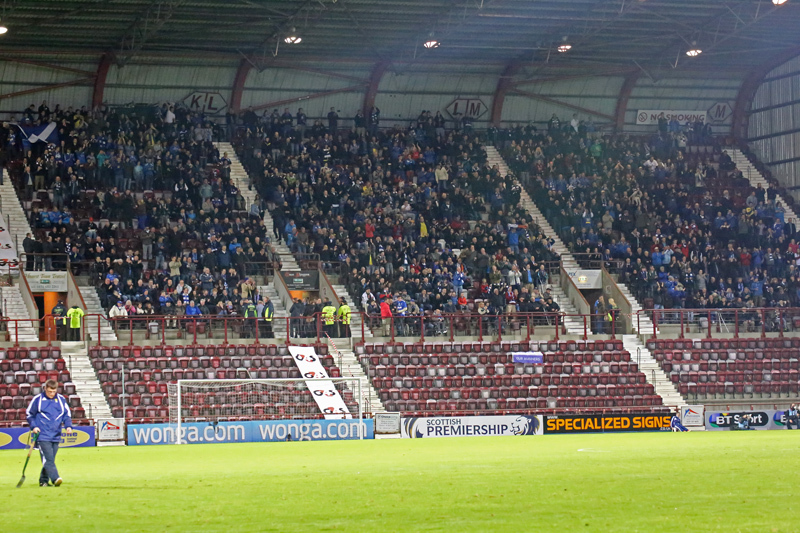 75 min Tonight`s attendance is 8381 with at least 1000 Queens fans in the away end. Once again excellent away support. 82 min Hearts on the attack now and it looks like they have a chance from Walker`s cross but Kevin Holt is there in time to clear. 85 min Chance for Queens. Nice play from Lyle as he touches the ball on to McShane 18 yards out but his snapshot is straight at McDonald. 90+13 min Apologies, we are having some technical difficulties at the moment. Some updates are taking time to upload. 90+30 min Hearts have looked pretty comfortable since the goal but Queens look like they might have another goal in them.